Crispy Chorizo Potato Breakfast Hash cooked entirely on your Big Green Egg is a great way to start the weekend. The combination of the chorizo sausage with the potatoes is deeply satisfying. Now sit back, grab your favorite Bloody Mary, and enjoy this post for Crispy Chorizo Potato Breakfast Hash. A big shout out to my Instagram friends Tony and Maribel for the recipe inspiration. The ingredients for this recipe are easy: red skin potatoes, diced onions, eggs, chorizo sausage, and chicken broth. Setting up the Big Green Egg using a Plate Setter for indirect heat at 400°. Once preheated place the Cast Iron Dutch Oven inside filled with the chicken stock. Close the lid and let the stock come up to a slow boil before adding the potatoes. Once the potatoes are fork tender pull the Dutch Oven off the Big Green Egg and drain the potatoes. Next, gather the rest of the ingredients: chorizo, onions, potatoes, eggs, and garnish. Place a Cast Iron Skillet into the Big Green Egg and let it preheat before adding the chorizo (removed from the casing). Stir vigorously to break up the sausage as it cooks. Once done, add the diced onions and continue to stir mixing well. Next, add the potatoes mixing all of this together. For a spicier version add a teaspoon of chili powder to give it a little extra heat. The potato and onion mixture absorbs all that good flavor from the chorizo and begins to form a crispy crust. Press the mixture down forming three pockets allowing you to crack the eggs into them. Close the Big Green Egg and let the eggs cook to a perfect over easy. Pull the Cast Iron Skillet and garnish it with the Cojita cheese, jalapenos, and cilantro. This dish was amazing and is something I will cook again and again! 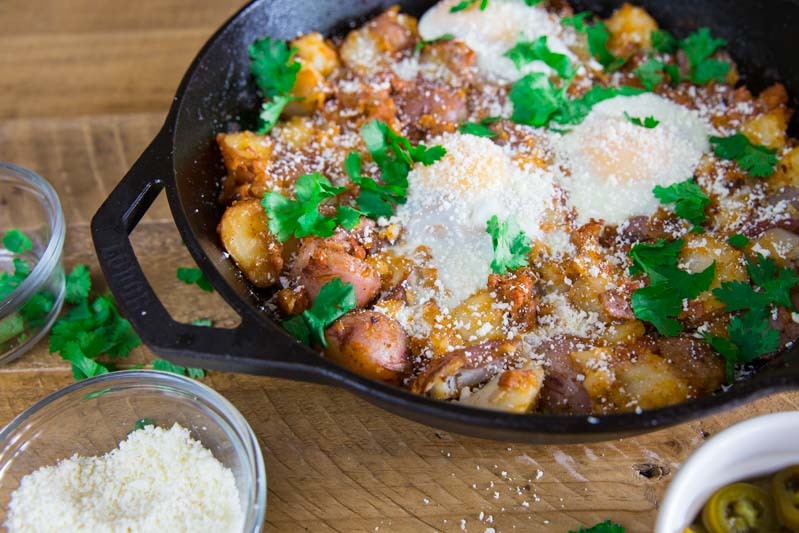 Getting a crispy Crispy Chorizo and Potato Breakfast Hash on your Big Green Egg is easy to do. Looking for a delicious breakfast option to cook on your grill look no further than this recipe!